I have a feeling Jimmy and I will never truly be “done” working on Baby Z’s nursery, and I’m totally okay with that! 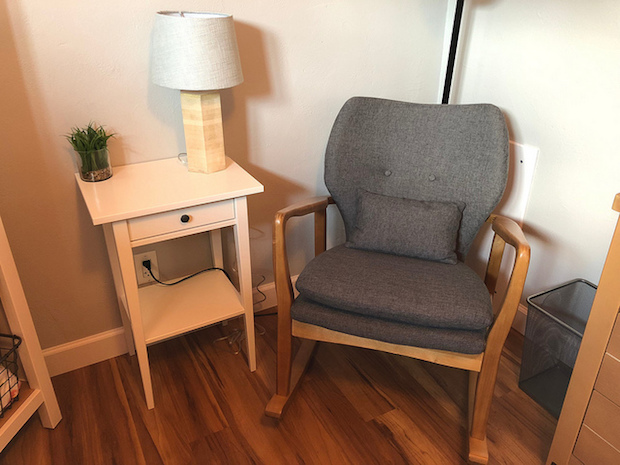 As I mentioned in a post about overhauling our master bedroom, I feel like a room becomes stagnant when you consider it fully decorated. I think we’ll always be changing things as our little chicka grows and we find a rhythm with how we use her space. 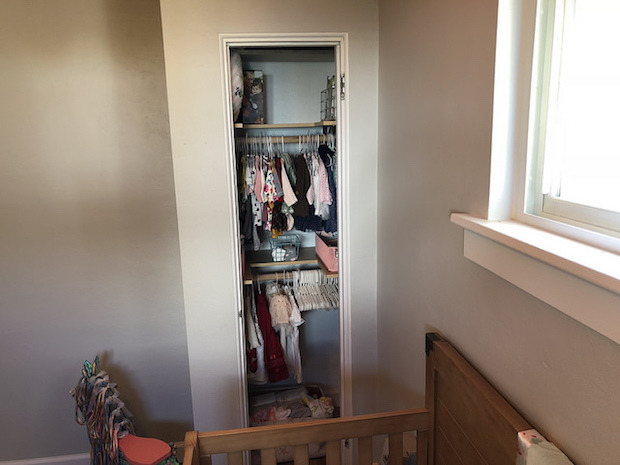 With that said, there are some things we want to add to her room–a mirror, more shelving, blinds, some art, etc., but I’ve put off sharing pictures long enough! 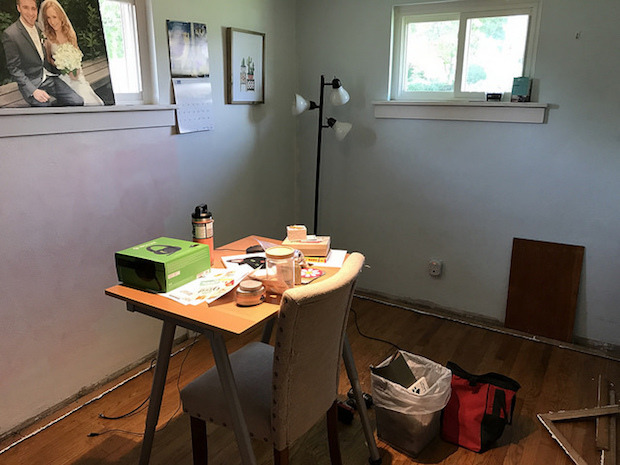 As I mentioned in a previous post about the nursery, our daughter’s room was our home office. We cleared everything out and this is what it looked like before we got started. Jimmy did so, so much work in here! 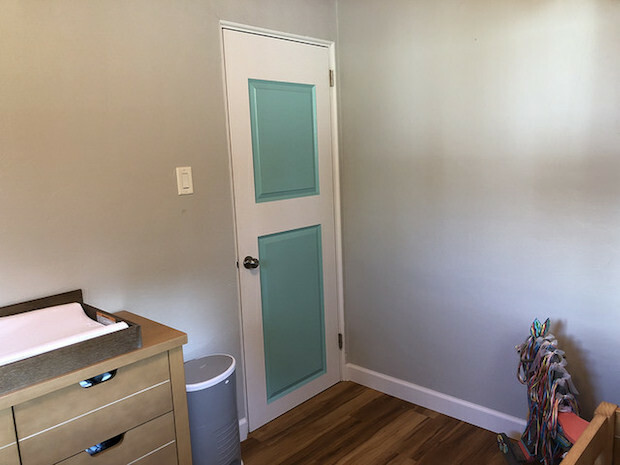 He installed new flooring, painted the walls and ceiling, installed new baseboards, put in a new door and painted it, installed a ceiling fan, put together all the furniture, and painted and designed the closet space. He continually impresses me with his skills, handiness, and creativity. 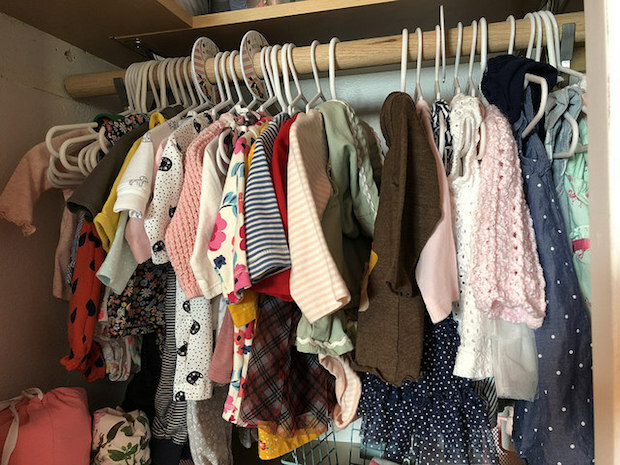 All I had to do was come up with design ideas, wash and put away her clothes, and organize all the wonderful gifts we were so generously given at our baby shower. Here’s a little tour of the space! 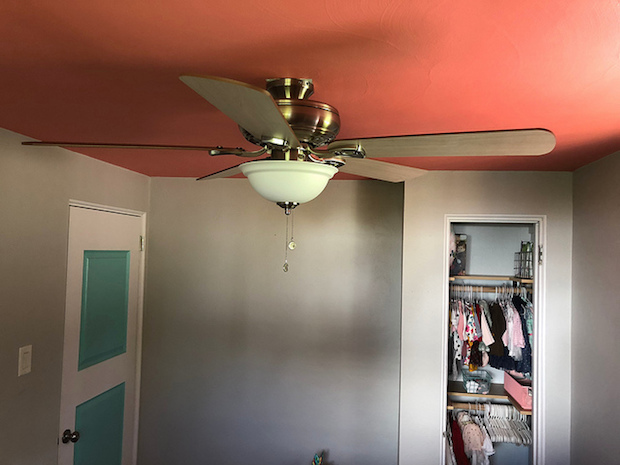 One of my favorite details of our daughter’s room is the gray rug above. I just love the texture and how cozy it makes the space feel. I can’t wait to see her crawling around on it in a few months! 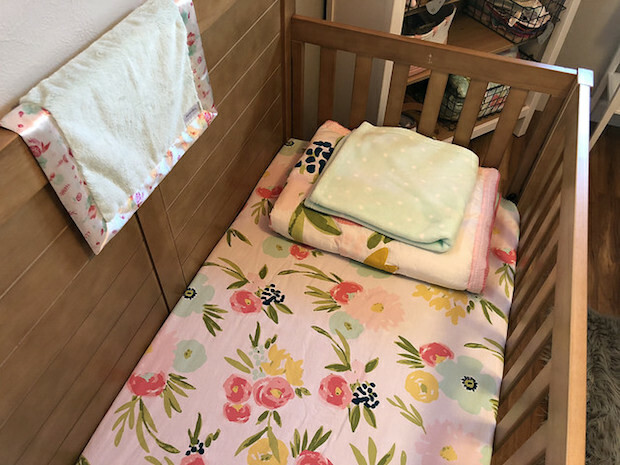 We have a little rocking chair nook all set up for nighttime feedings, and one whole drawer of her dresser/changing table is devoted to diapers, wipes, and hand sanitizer–you know, the essentials. The rocking chair is another favorite item of mine in the nursery! It’s super comfy and everyone who visits loves sitting in it and rocking. 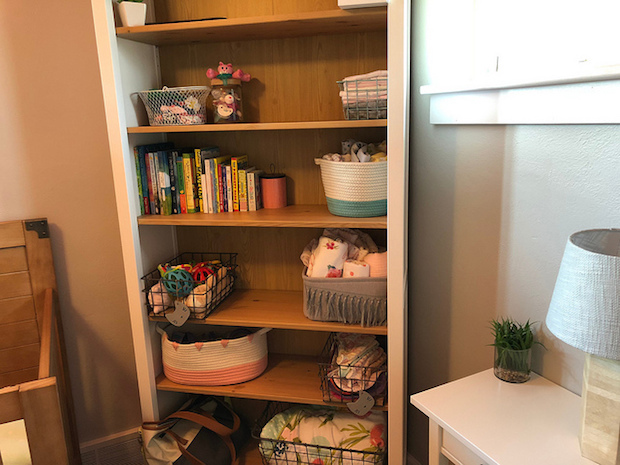 Baby girl’s bookshelf is stocked with a random assortment of toys, blankets, books, bibs, swaddles, pacifiers, headbands, burp cloths, a play mat, and her diaper bag. We kept her toys up a few shelves because the pets are very interested in her rattles and balls! Also, I can’t wait to see her using the “I ❤ Daddy” pacifier if she likes pacifiers (apparently my siblings and I would spit them out… sorry mom and dad! ), lol. The closet looks so different now! It was previously a dingy shade of blue with a metal rod and random shelving at the top. Jimmy built and installed shelving and rods and painted it a fresh coat of paint. 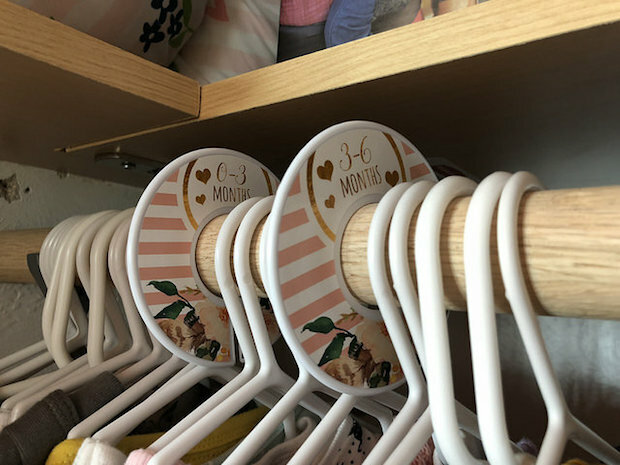 My mom bought us these little closet dividers which are such a cool invention for keeping Baby Girl’s wardrobe organized. Last but not least, we have the door, new ceiling fan, and some artwork! The door was 100% Jimmy’s idea (as was painting the ceiling; he’s so creative!) and I think it looks great. 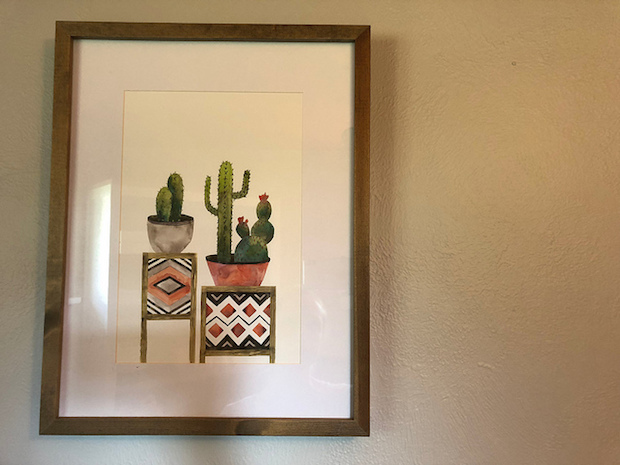 The cacti watercolor is actually something I’ve had for a few years now, back when I wanted to paint our office a peachy-coral color. It’s still one of my favorite pieces of artwork in our house. 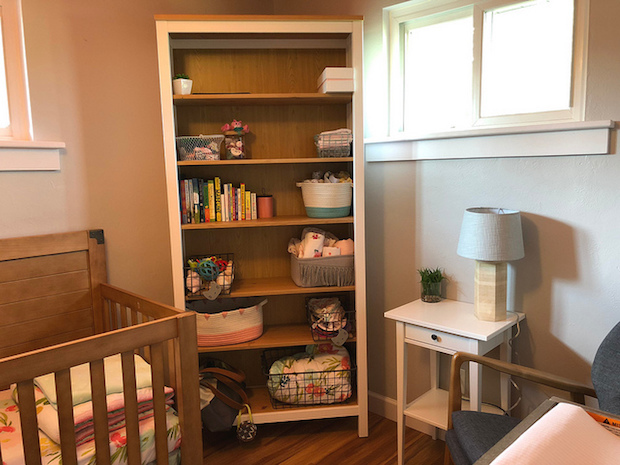 I think that about wraps up the little tour of our daughter’s nursery. 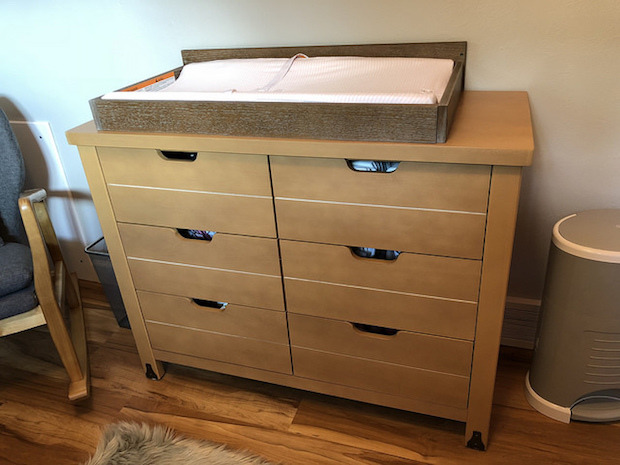 As I mentioned above, we have a few finishing touches to add, but it’s pretty much ready for our little one! We feel so blessed to have this sweet space for her and cannot wait to meet her soon, Lord Willing! I love it Allie!! 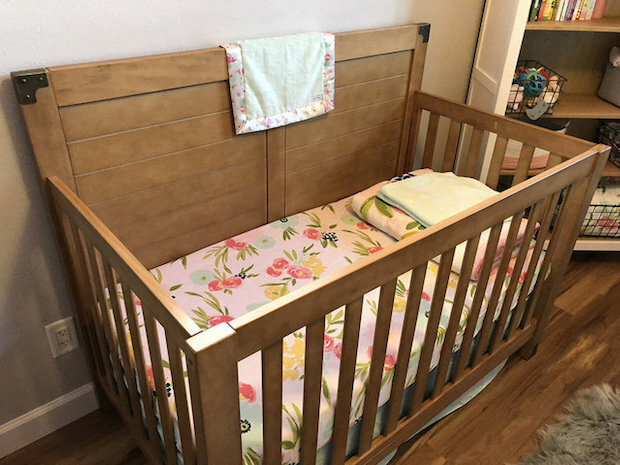 The crib is so unique and cool. You played a way bigger part in the design!!!! Oh my gosh, it’s so cute! I can definitely tell how much work was put into it. I’m loving that gray rug, too! Thank you, Hunida!! 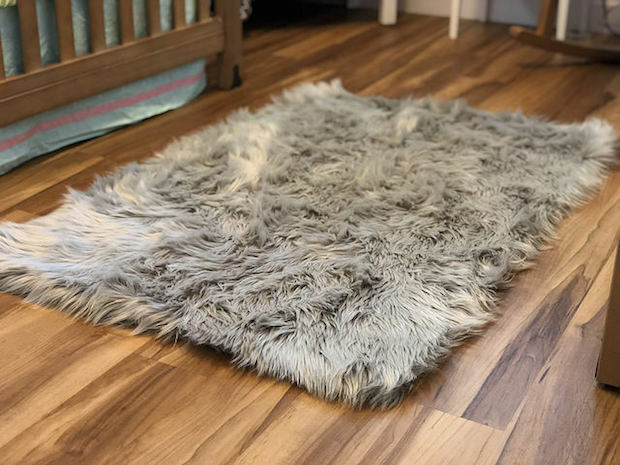 The gray rug gives me major heart eyes every time I see it!! Such a sweet, cozy, safe space!! Your little girl is going to dream so many beautiful dreams in that room. I love how it has come together. Yay! Thank you so, so much Amy!! Thank you (from both of us! ), Ellie!! oh my gosh, I am SPAZZING over here. This is so stinking cute!!! SO CUTE. I don’t even know what to say.. wow.. you guys did such an awesome day, and that is one lucky baby girl! What a beautiful, cute, adorable, perfect room! 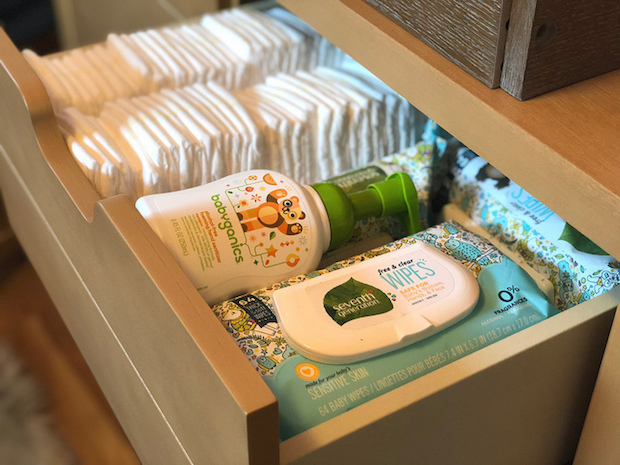 Thank you so much for sharing, Allie! Aww, thank you so much Mackenzie!! That means so much to us! Oh my goodness, I love it!!! You guys did such a great job! It’s so cozy looking and adorable. 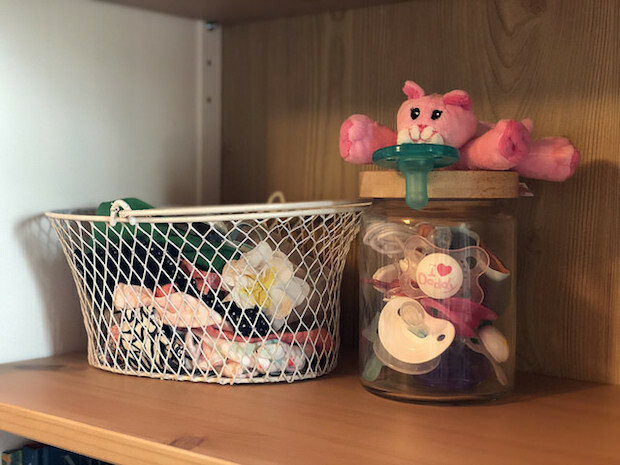 Putting together the nursery is such a sweet way to prepare for your little one’s arrival. Soon!!! 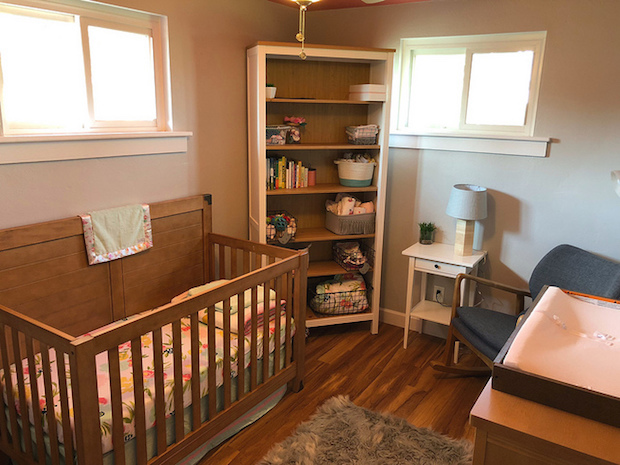 It truly has been so fun to put together her nursery as a way to prepare for her grand entrance!! Thank you so much for the sweet compliments!! I love her nursery so much!! You and Jimmy did a fantastic job to welcome your sweet little bundle. I am sure she will feel safe, snug and cozy in her beautiful bedroom that was built by such loving and caring parents. I am amazed by how organized everything is already! It looks like such a cozy space. Thank you, P! I feel like it has taken me for-ev-er to organize it!! Cozy was exactly what we were going for, so I just love hearing that!